As I've mentioned before, I've made a lot of improvements to the blog engine that powers this site. 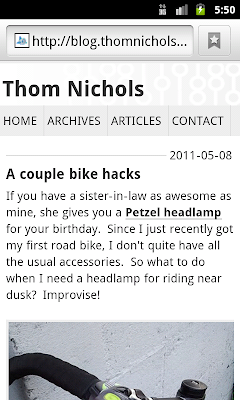 My latest enhancement is a mobile style sheet so the site looks just as good on an Android or iPhone as it does on a PC. The content is identical to what is served to a non-mobile client. There's no user-agent detection going on, just CSS overrides. Comment submission features are hidden (since I'm fairly certain it won't work) but other than that it's a complete mobile rendering of the site. You can see the source here. Cache debugging: Page was rendered Apr 21, 05:15:38.